FDL 2.0 was increased to eight weeks. Five teams studied solar storm prediction, solar terrestrial interactions, lunar water and volatiles, long period comets, and asteroid shape modeling. A large dataset was compiled for the Lunar south polar region and high-level feature extraction focusing on crater detection was performed. Results showed an impressive speedup of 100x compared to human experts, with more than 98.4% success rate. Continuing the work from 2016, the team applied AI techniques along the shape modeling workflow. Asteroid shape modeling currently takes up to four weeks of manual interventions by experts using established software. The team demonstrated a pipeline for automation, optimizing the Neural Nets and utilizing GANs, that allows NEOs to be modeled in several hours. The application of AI to detect solar flares and better understand the salience of solar activity and Space Weather - crucial for future human spaceflight missions. The FDL team performed analysis of solar magnetic complexity and deployed multiple CNNs to connect solar UV images (Solar Dynamics Observatory / Atmospheric Imaging Assembly) into forecasts of maximum x-ray emissions. The work suggests there is potential to improve the reliability and accuracy of solar flare predictions. Demonstration of AI as a tool for scientific breakthrough, via ‘discovery’ of the (previously known) equatorial ring currents of Earth’s Magnetosphere. 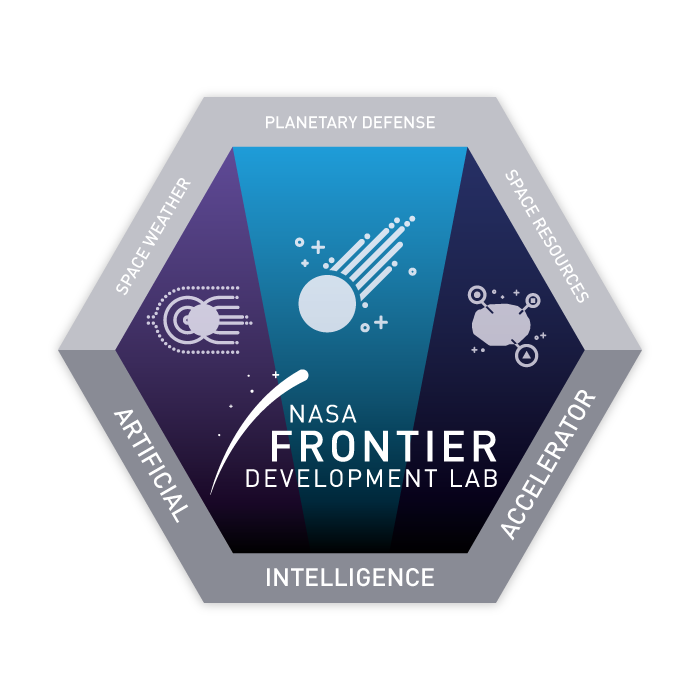 The FDL team built a knowledge discovery module named STING (Solar Terrestrial Interactions Neural Network Generator) on top of industry-standard, open source machine learning frameworks to allow researchers to further explore these complex datasets. Discovery of uncategorized meteor showers, which may suggest the presence of longperiod comets that cross the orbit of Earth on millennial time scales. The FDL team showed how the data reduction of the ‘CAMS’ (Cameras for Allsky Meteor Surveillance) meteor shower survey program could be successfully automated. By using dimensionality reduction (t-SNEs) the team were able to identify yet to be catalogued meteor shower clusters.